You’d think that lettuce would have no scent, but if you put your face up to it, the aroma is tangy and wet like rain clouds. That’s what I smell as I walk along next to Phil Loomis at his Jacona Farm north of Santa Fe. We pass beds of autumn red lettuce, two star and romaine. Then the scent turns sharp as we come to arugula and spinach. At the door of a greenhouse, the Thai basil’s pungency nearly overtakes me. “As the day gets warmer, the smell gets so intense you can barely stay in there,” Phil says. At the Santa Fe Farmers’ Market, he’s known as the “Lettuce Man.” Out here on his four acres of cultivated fields, surrounded by cottonwood and apricot trees, century-old adobe homes and a few house trailers, I scan the beds, trying to figure out his secret. The lettuce tastes sweet when it touches your tongue, then a hint of bitter sneaks in, followed by a smooth buttery flavor. It doesn’t turn brown at the cut edges as lettuce tends to do; even after a week in the refrigerator, it magically stays fresh and crispy. Phil’s background may be part of the secret. He comes from a family of Welsh coal miners, but his mother was raised on a farm in Kansas. “She taught me a lot,” he says, “mostly a love of growing things. Growing seems intuitive, and I think I got that from her.” As a child Phil enjoyed working in his family’s large garden in Albuquerque. He left the state for many years, but returned to the area and, in 1991, bought this farm with his partner because of the dark river-basin soil and the reliable Larga de Jacona acequia. The farm sits at the point where the Tesuque and Nambé Rivers converge. “Here, in the night, the cold sinks down,” he says. This creates some farming challenges, most notably freezing in late spring and early fall, but it also helps crops such as spinach, garlic and lettuce, which like warm days and cool evenings. 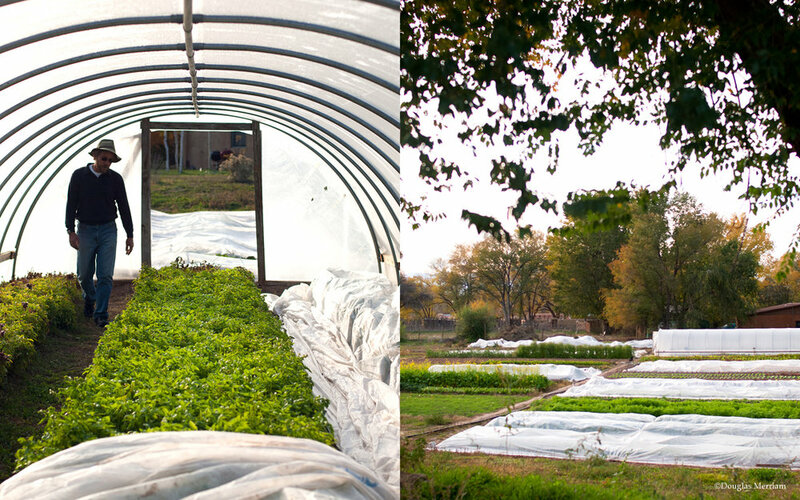 The place has a long farming history that’s embodied in its name. “The word Jacona is a Tewa Puebloan word meaning ‘place by the cliffs where they grow tobacco,’” he says.